Z. I'm finally to Z. Hooray for me. 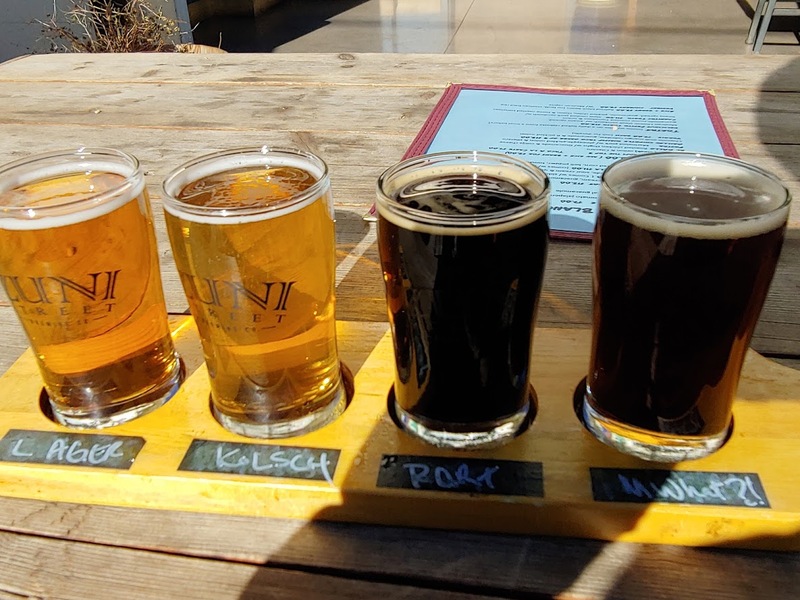 Yes, I am finally down to the last letter in my A to Z Denver Breweries series. I bet for awhile there you probably never thought I'd get here. 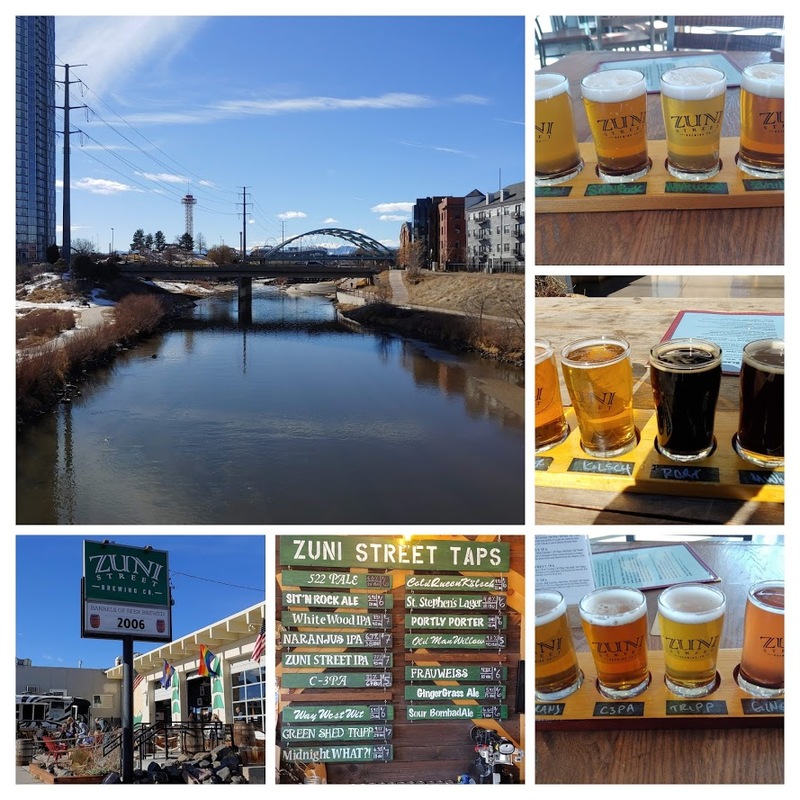 Well, way back in February of 2015, I composed a list of Denver Breweries that I had never visited. I was embarrassed by the large number of breweries I had never been to, and decided to try to make an effort to get to more. It struck me that most of the letters of the alphabet were covered by the beginning letters of the brewery names. 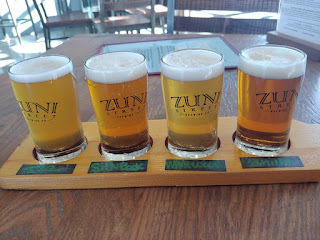 I thought a fun way to get through a bunch of un-visited breweries was to start with A and work my way through Z. If you follow this blog, you likely caught that I hit "Y" just a little while ago. I could be wrong, but I am pretty sure when I started this journey, Zuni Street Brewing Company didn't exist. 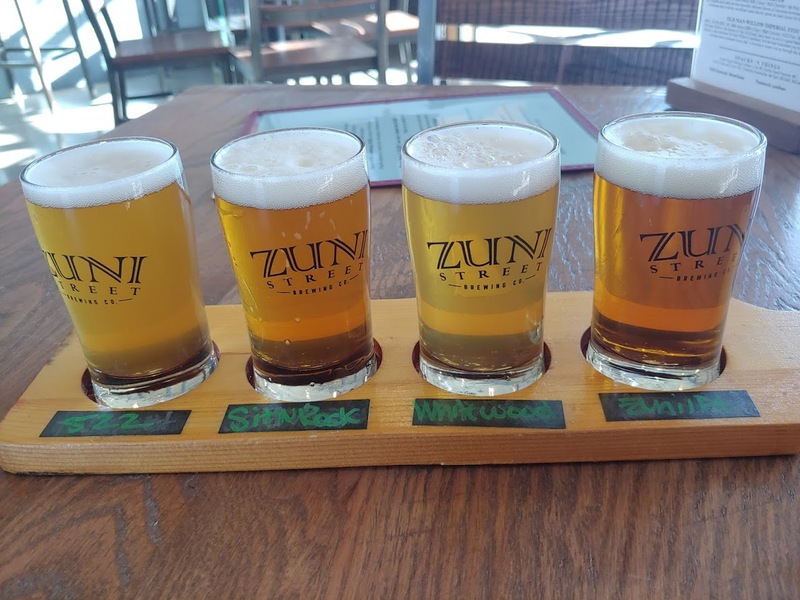 It is lucky that it exists now, because the "Z" brewery I was planning on at the beginning doesn't seem to exist now. Not sure if it went out of business or changed names or what, but I can't find it anymore. 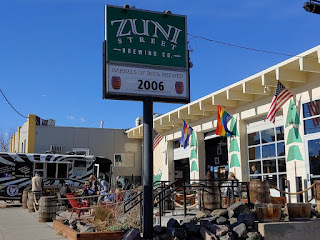 Anyway ... Zuni Street Brewing Company is located in the part of Denver that I think are called "The Highlands". For me, it is a light rail ride and then a nice 20 minute walk. They don't serve food, but they have a regular food truck schedule. They also have quite a few special events scheduled. See their Food Truck and Events page for their schedule. 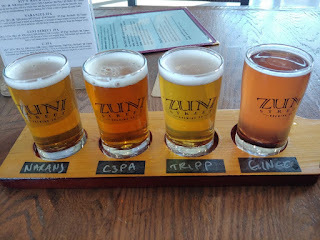 Last weekend, I took the light rail downtown and then walked to Zuni Street Brewing Company. I had a burrito from a food truck and a few flights while I was there. 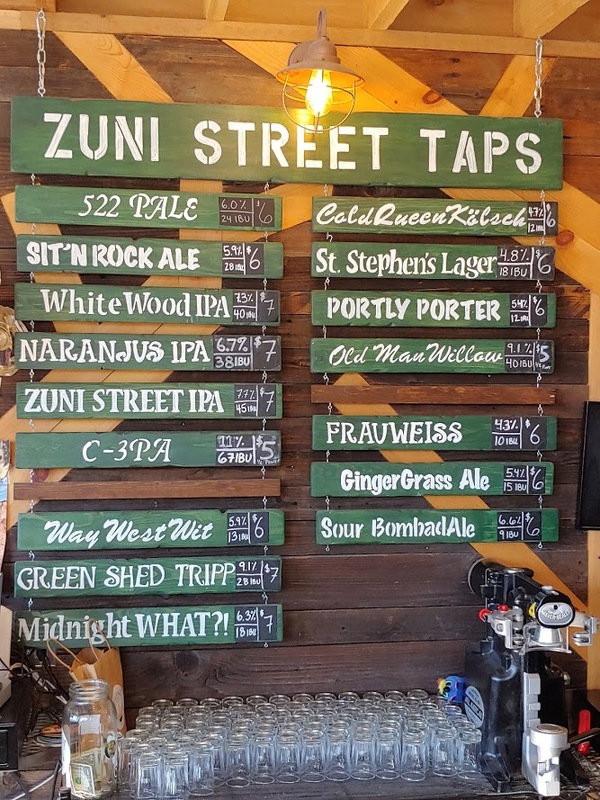 ABV: 4.8% IBU: 18 St. Stephen’s is a Vienna Lager brewed with a heap of specialty malts creating a caramel color and a pleasant, bready, biscuity aroma. The lager yeast gives this beer a clean character and crisp finish. Enjoyable beer. Not sure I would identify it as a Vienna lager, but I enjoyed it regardless of the style. ABV: 5.4% IBU: 14 Our English Porter, aged in a bourbon barrel. It had an interesting roast character and a boozy note. Good beer, but my least favorite of this flight. A dark Belgian abbey ale brewed with wheat. Notes of delicious chai tea spice result from the interplay of clove-like aromatics from the yeast, and a mound of freshly grated ginger steeped in the beer. A nice beer that did not show its alcohol. Dangerous, but delicious. BV: 6% IBU: 24 A bright pale ale brewed with an experimental hop known as the 522. Flavors of cherry, stone fruit, and an herbal spice come thru with the hops, while the brew still adheres to a bready maltiness. It was a good hoppy pale ale. ABV: 5.9% IBU: 28 Our flagship ale has the grain bill of a wheat beer and the hop profile of a pale ale. Smooth, easydrinking, with an unintimidating, fruity hop aroma, Sit’n Rock is one to please all taste buds. Another good pale ale. ABV: 7.3% IBU: 40 A juicy IPA packed with aromas of pineapple and grapefruit. Brewed with wheat and oats to provide a malty backbone, smooth mouthfeel, and hazy appearance. Nice flavorful IPA. My favorite of the flight. ABV: 7.7% IBU: 45 A bright, hoppy offering, packed with flavors of citrus and tropical fruit. Full bodied and smooth, this beer is well balanced and drinkable to no end. Another nice IPA with pleasant tropical hop flavor. ABV: 6.7% IBU: 38 This IPA went so East Coast it ended up in Belgium! A bouquet of hops creates aromas of orange, tangerine, and pineapple that blend perfectly with the fruity esters and phenols from the Belgian yeast. I'm not generally a fan of the Belgium IPA, but I enjoyed this one. ABV: 11% IBU: 67 In honor of the greatest droid not named R2-D2, C-3PA is a triple pale ale brewed with Cascade, Centennial, and Citra hops. With the highest ABV on the menu, this one might fry a circuit or two! A little too heavy in the mouthfeel for me. The alcohol comes through more than the hops. Good, but not great triple IPA. ABV: 9.1% IBU: 28 Assembled in the Green Shed, this golden trippel packs an aromatic punch of banana that perfectly melds with the tropical and melon aromas from the copious amount of dry hops. Finished with a nice champagne spritz and a slight clovey twinge. My favorite beer of the day. Really well done beer. ABV: 5.4% IBU: 15 This refreshing German ale is brewed like a tea with fresh ginger, ground hibiscus flower, and lemongrass. Sure to please beer and tea drinkers alike! Another well-made beer. Exact right amount of ginger and lemongrass. I enjoyed my time here. It has a great neighborhood pub vibe and delicious beers. What's not to like? If you have not already, check it out. It is worth the trip. And so ... I'm done with the alphabet! Exciting ... right!? 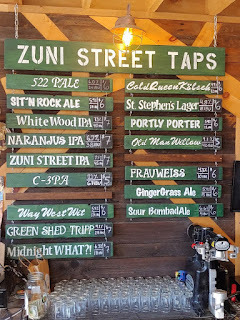 If you want to check out the other breweries I visited as part of this little project, check out Sheppy's Blog: A to Z. Since there are still so many breweries that I have not visited ... I might even start over at "A" again.